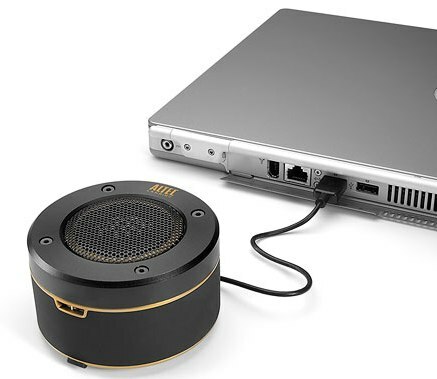 Altec Lansing has expanded the Orbit family with its new Orbit USB (iML237), the ultra-portable, powerful laptop speaker that combines stylish design, surprisingly big sound and the convenience of plug-and-play USB connectivity in a single device, seems perfect for the frequent traveler. Audio Alignment – Perfectly balanced components ensure ultimate sound. Incredible digital clarity – From the source to the speaker, sound stays digitally wired through the USB connection. No fuzz, no muffle, just high-quality audio. 360° sound field – Push astonishing sound in all directions. USB powered – Just plug and play, without the need of batteries or AC cord. Tough design – It can handle knocks thanks to aluminum and composite construction. Retractable stand lets users aim the sound in any direction. Altec Lansing Orbit USB (iML237)that weights less than 6 ounces is scheduled to be available at BestBuy, Amazon.com and other consumer electronics retailers starting mid-September 2009 for around $50.